George Meany, the son of a plumber, was born in New York City on 16th August, 1894. After a brief schooling he became a plumber. Meany was active in the United Association of Plumbers and Steam Fitters and in 1932 was elected as vice president of the New York State Federation of Labor and two years later was elected president (1934-39). Meany was also secretary-treasurer of the American Federation of Labour (AFL) and on the death of William Green in 1954, became president. 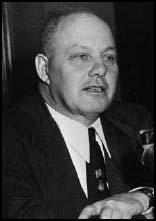 A dogmatic leader, he expelled Jimmy Hoffa and the Teamsters Union in 1957, and ten years later, a dispute with Walter Reuther led to the United Auto Workers leaving the organisation. George Meany died on 10th January, 1980.